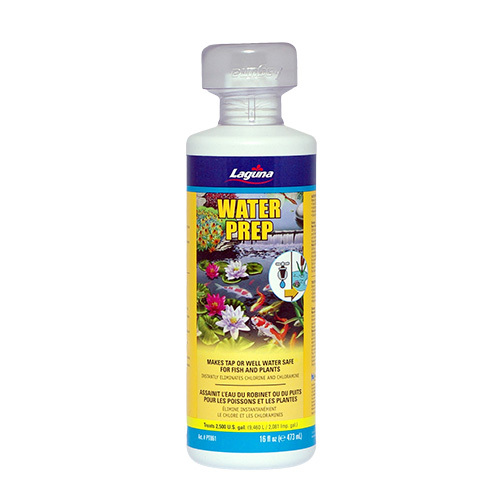 Laguna Water Prep is specifically formulated to provide several benefits to the entire pond environment. It makes tap or well water safe for fish and plants by instantly eliminating chlorine and chloramine and neutralizing harmful metals, plus it coats and protects fish fins and scales. Use 50 mL per 265 U.S. gal. of pond water (1,000 liters /220 Imp. gal.). Use the doser cap provided for an accurate measurement. Fill pond with water and then add Water Prep directly to pond. This method is not recommended when fish are already in the pond. (See Water Replacement). Use 50 mL per 265 U.S. gal. of pond water (1,000 liters /220 Imp. gal.) every time water is added from the tap. Use the doser cap provided for an accurate measurement. To ensure maximum protection for fish already in a pond, dose the pond before any new water is added. For pond water treatment only.